Growing up, one of the first songs many of us learned was “If You’re Happy and You Know It…” The verse takes us through three actions: clap your hands, stomp your feet, shout “hooray!” Each verse reminds us that if you’re happy and you know it, “your face will surely show it.” Most of us probably enjoyed the activity (even thinking about it now makes me smile), and it taught us a particular way to express joy when we felt it. Expressing happiness and being around happy people not only makes us feel good, it can make others feel good, too (you can read more about that here and here). But what is happiness? If you go by the children’s song, and take a cue from countless other images and messages society delivers us, you’d believe that being happy meant you were smiling, laughing, worry-free, and bubbling over with enthusiasm. We set an expectation of what happy looks like, and people who don’t match that expectation are judged to be unhappy. Introverts can and do experience over-the-top joy; I remember getting a coveted grad school acceptance letter and practically skipping back to my dorm room with unfettered glee. But most of the time, my happiness is an inner calm, a feeling of peace and being centered. My outward expression may only go so far as a Mona Lisa smile that extends to my eyes, which is not always an obvious (or fully satisfactory) signal to the rest of the world that I’m perfectly fine, thank you very much. People who don’t understand the introvert’s internal orientation think that we must be depressed because our expressions of joy seem muted to them. Maybe we don’t want to clap our hands, stomp our feet or shout “hooray” so that everyone else knows we’re happy. And maybe we’re happy, but our face surely doesn’t show it. If you can’t read us and want to know how we’re feeling, ask us! We’re most likely happy (ha!) to share. We might even be flattered that you asked, since it shows you care enough about us not to make assumptions or try to “fix” something that isn’t broken. And when we tell you that we’re fine, believe us. You can dig a little bit if you think you know us well enough and you suspect we’re not being totally honest… but otherwise, take what we say at face value. How do we start to re-frame the concept of happiness so that it reflects the wide and beautiful range of expressions and feelings we have, rather than just sticking with the obvious? Here’s one way to kick-start a conversation: In the recently released second edition of Laurie Helgoe’s “Introvert Power,” she adds a new chapter about shifting how we define happiness; you can get an in-a-nutshell idea of Laurie’s perspective in this interview with Nancy Ancowitz on Nancy’s Psychology Today blog. PS: I find it amusing that the featured image I use in this post is considered a “demotivational poster,” yet I see nothing wrong with it (except I’d prefer to be face up, preferably in a hammock). Please share in the comments: What’s true for you? 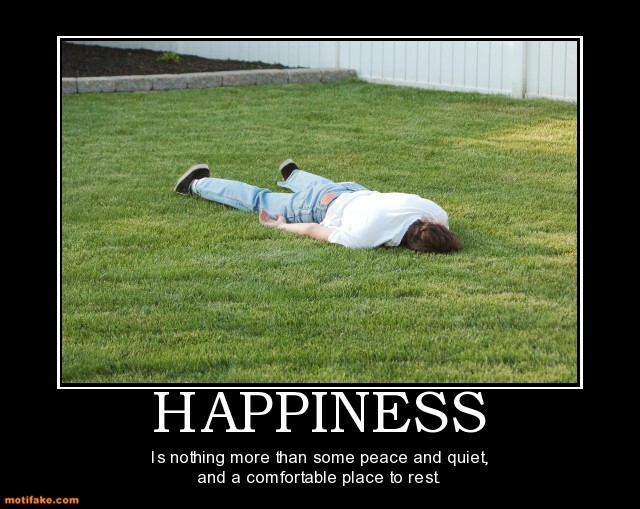 How do you experience happiness? This. Is. AWESOME. I teach a preschoolers yoga class and we do the If You’re Happy and You Know It song, and THIS VERSION IS PERFECT FOR YOGA! Marnie, that’s so cool! I love it!! Thank you so much for writing and sharing this. I related to it but I also found a very valuable teaching tool for others. I’m really grateful to have read this! SO incredibly true. Thanks for writing it! Have to share coz it’s so true. For example, when my liver specialist told me the results of the cancer test that it was negative and that i DIDN’T have cancer, I gave a tiny muted Mona Lisa smile even though inwardly OF COURSE i was glad i wasn’t going to die an agonising death. I’d LOVE to be one of those people that’s all loud and bubbly. I believe that I would be accepted more readily in a group if I were like that. But my brain is wired up in a muted quiet way. The same feelings are there, but can’t come up to the surface. Love the new song & poster! How about when a coworker says, “smile!” like it’s a command? Just because you don’t see me smile doesn’t mean I’m unhappy. This post makes me happy. A photographer was taking our family picture many years ago. He kept telling me to smile. It was driving me nuts. I finally said “I AM smiling” and the family just cracked up. My husband then backed up what I said. Often, when I am pensive, people will ask me what’s wrong. I just don’t walk around with a toothy grin but am happy most of the time. It’s a good life. I’m copying this post to hand anyone who thinks I have no feelings. Love it. I don’t like people telling me to smile or that I don’t happy. Really? Gets old. I am just not loud and expressive…unless I want to be. Good article. Sometimes being deep in thought makes me very unaware of others around me. It’s not my job to make them feel comfortable or better by smiling all the time. That is just exhausting. I rarely exprss my happiness outwardly. Thanks for the enlightenment. Also, I have to tell you that I LOVE the Introvert Entrepreneur fb page! I love this Beth! It’s so true, that those of us who are more reserved tend not to express our happiness as obviously as our extrovert friends. I can always tell when an introvert wins something on the radio because their response is so much more muted, not the “woo hoo, oh my God, this is incredible…” extrovert response. And, to be honest I would wonder if they were really excited. But, your post reminds me that we all express happiness and excitement in different ways and that’s just fine. Thank you for always giving us introverts space to be just the way we are. Outstanding post. I’ve had numerous arguments with people over the fact that I say “I’m fine”. To me that means I am, in fact, fine. I’m content. Things are at peace. I don’t say “I’m great” and then launch into a dissertation about all the things that contribute to the greatness. This confuses people! I was just thinking about this exact thing! I get it at work all of time and spend way too much time explaining that I am really fine. I have decided to simply start replying, “looks can be deceiving” and leave it at that. This reminds me of a recent birthday. We went to see a band with a couple of fairly new friends to celebrate. Throughout the night, people kept checking in with my husband and asking if I was ok, was I having a good time? They truly couldn’t tell! Yes! Isn’t that how it goes so often for us?! Thanks for sharing, Trudy. Sometimes I will be sitting, thinking and feeling calm, and people will ask me (worriedly) if I’m ok.
My daughter-in-law(super extrovert) is always asking if I’m sad. I think there’s a fair amount of people who are trying to convince themselves they’re happy. I see it in my feed frequently. 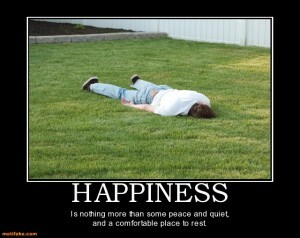 I saw the green grass and the word happiness and I thought this post had to do with spring. Nothing would make me happier than green grass right now. Right now I am having the worst day of my life. How ironic. Ack! So sorry to hear that, Joe – I hope things are looking up today. I get so tired of people asking me if i am okay just because i am not chattering away and grinning all the time! When I am happy you would hardly notice it, because I smile into myself. Simple? I fully agree with this sentence in your post. I would appreciate others to just ask instead of jumping to conclusion through their personal bias. Spot on!